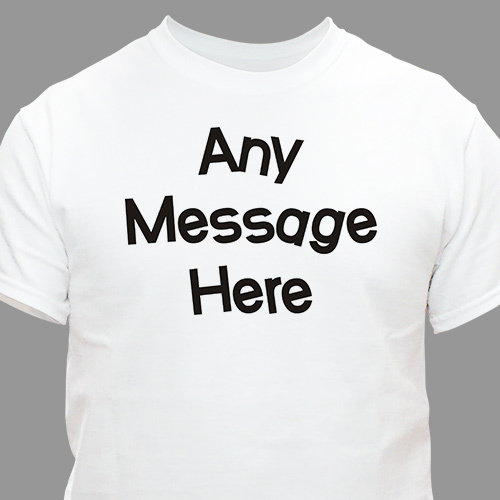 Personalize one of these Personalized T-Shirts with any phrase or saying you would like. Create a funny, serious or goofy personalized shirt for family or friends. This Custom Printed T-shirt makes a great birthday or special anniversary gift. Our Custom Printed T-Shirt is available on our premium white 100% cotton Custom Personalized Shirt, machine washable in adult sizes S-3XL. Custom Printed T-Shirts are also available in Pink and Ash Grey. Custom shirts includes FREE printing! No setup fees and no minimums. Personalize your Custom Printed T-Shirt with any three line message in our Crazy lettering style; choose between 10 different colors for the text. I bought this shirt as a gift for my dad. I was happy that I could customize the message. He really liked it and appreciated the personalization. Loved how this t-shirt turned out. It will be perfect for my mom's 70th birthday. Custom Printed T-shirts make an excellent Unique Father's Day Gifts! This design is also available on our custom printed sweatshirt, custom printed coffee cups and more custom engraved keepsakes. GiftsForYouNow.com has an entire collection of Personalized T-Shirts. Our Personalized T-shirts are perfect for Christmas, Mother's Day, Father's Day, Sweetest Day, Valentines Day & Birthdays. Create a custom T-shirt for someone in your family today. Mom, Dad, Sister, Brother, Grandma or Grandpa will love this wonderful t-shirt which you have personalized just for them.